Anyone know what kind of mushroom this is? home » garden ideas » What is this Plant? » Anyone know what kind of mushroom this is? 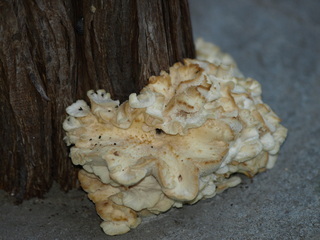 This mushroom is growing out of a cedar post by my front door. Any ideas on what it is? That site is amazing! I can't believe some of the mushrooms are purple. I loved the one called "old man's beard." What an amazing variety! Who knew! Thank for the link. That looks like a fungus (mushroom family, doubt that it&#x27;s edible) that has grown at base of the cedar because something either inside or underneath the cedar is dead. What you are looking at is actually the &#x27;fruiting body&#x27; of the rest of the organism. They thrive on rotting, decaying material. Gross! Thanks for the info! Is this the first yr. or has it grown before? Very cool looking... I have a friend who&#x27;s a mushroom hunter and aficionado, so I&#x27;ll ask him :-). Thanks - I look forward to hearing the answer! Cliff - was your mushroom hunter able to identify my mushroom? The pill bugs are loving it. Just curious! Thanks.